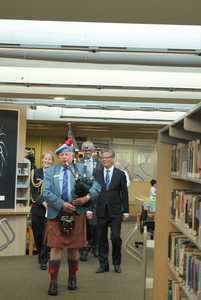 Burnside Library and Gallery provides a proud venue indeed for the Diaspora Tapestry, and before HE The Governor The Honourable Hieu Van Le, AO, could arrive preceded by the Piper, more than 500 had had a sneak preview. 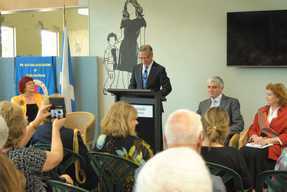 The Governor was accompaniedby His Worship The Mayor of Burnside, David Parkin and the President of the Scottish Association of South Australia, Jean Lumsden. 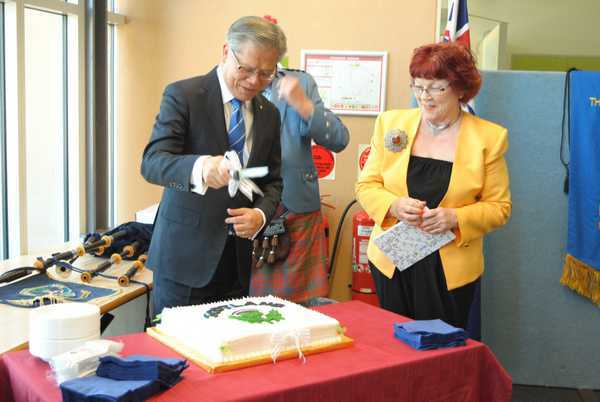 Fiona Hyslop MSP sent a message of Greetings for the occasion and Rosemary McKay, the Senior Adelaide Host for the Scottish Association of South Australia, gave him their formal Welcome and supervised the cutting of the 'Thistleated' Cake. 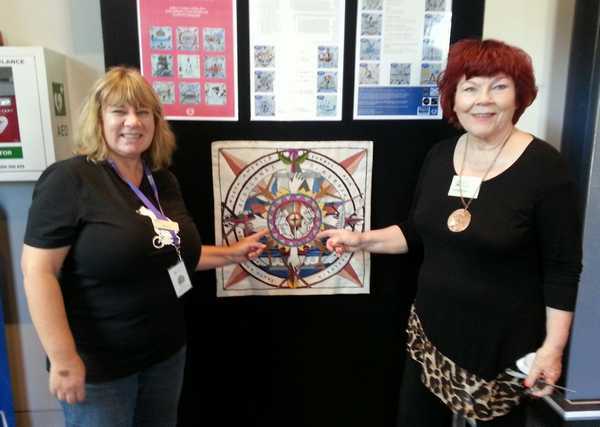 The exhibition has been arranged in Adelaide by Sharon Downing of the Burnside Library [left] and Rosemary MacKay, one of our stitchers and Events Co-ordinator of the Scottish Association of South Australia. 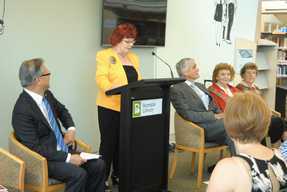 Not surprisingly, Fiona Hyslop MSP [who'd been looksee in Paris] sent Greetings since Adelaide is well known to her! 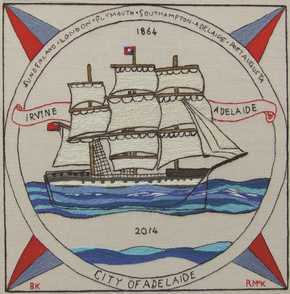 They recently retrieved the Clipper Ship Adelaide from ruin on the Clyde and have taken it back to South Australia for restoration. 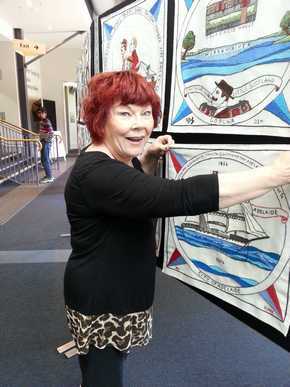 Rosemary helped that campaign and indeed stitched the panel telling its tale [see below]. 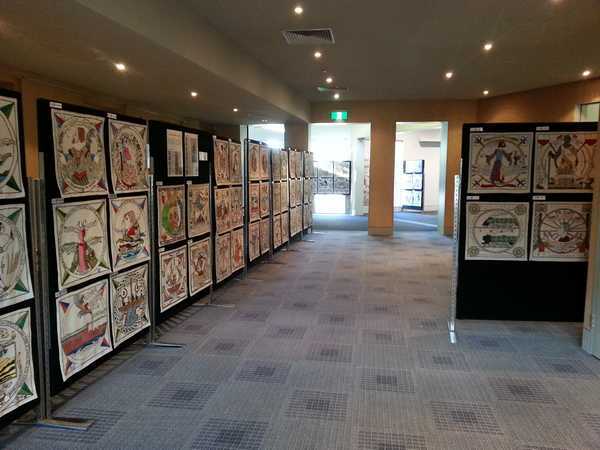 The South Australian Association had long looked forward to the exhibition and an extensive programme of activities has been arranged. 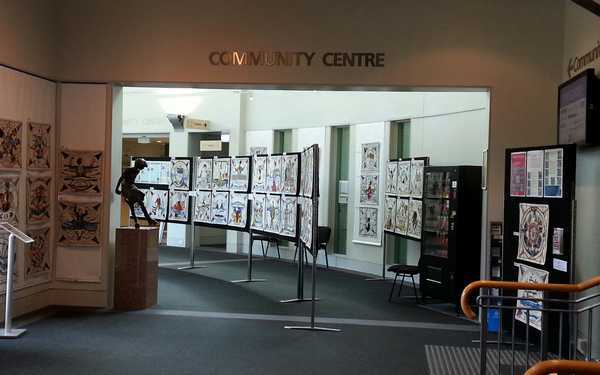 Many include an in-depth look at the stories behind the panels stitched in South Australia. 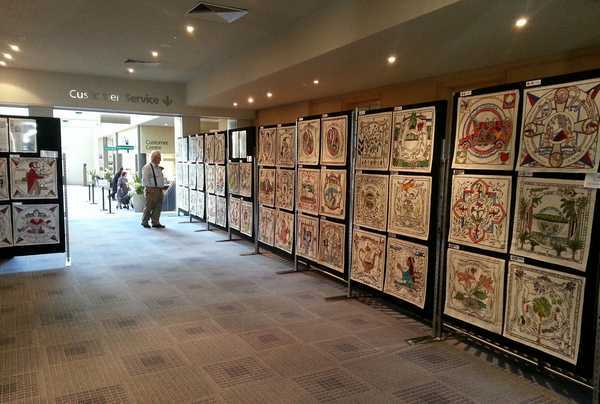 Pictures of the Grand Finale Concert on 13th are eagerly awaited before the tapestry travel across to Hobart Tasmania for the New Year. Wed 2nd Dec - “Catherine Helen Spence” Talk by author and poet Tony Brooks. 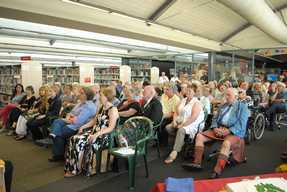 Frid 4th Dec “Sir Thomas Elder” Talk by Dr Kim Murray at the Commonwealth Club of Adelaide. Tues 8th Dec “John McDouall Stuart” Talk by Rick Moore President of the JMS Society. Wed 9th Dec Guided tour of Urrbrae House by Lynette Zeitz. Thurs 10th Dec “History of the Royal Caledonian Society” Talk by Christine Cockerill. Sunday 13th Grand Finale Concert with Eric Bogle, the Borders, Russel Starke, Border Celts, Garrick Stewart School of Highland Dancers, Jean Dodd’s Scottish Country Dancers, The Colonel Light RSL Pipers and Tony Brooks poet.